People of all ages love to see art in their community. It adds interest and bridges the gap between younger and older generations. There is much planning and organization necessary to create a public art project, especially for a library. One of the important things to consider is your financial resources. Will the funding be done by the library, Friends of the Library, in-kind donations or from your current operating budget? What type of art will be most appropriate? Murals and sculptures are two popular mediums. What type of materials will be used? Metal (such as bronze), concrete, wood, paint or canvas. Installation and maintenance are two areas often overlooked but are an integral part of the process. Each should be simple with minimal time required. This is a priority when considering public art. Children are better able to appreciate art as it relates to them. Over the last several years, the trend has been for the art not only to be admired, but also to be functional. As an example, bronze sculptures of children reading on a bronze bench draws attention and has seating space that invites a child to become part of the sculpture. For parents, the sculpture evokes emotion as they see their children excited about art. Oftentimes parents will take a photograph which adds to the impression the art creates. 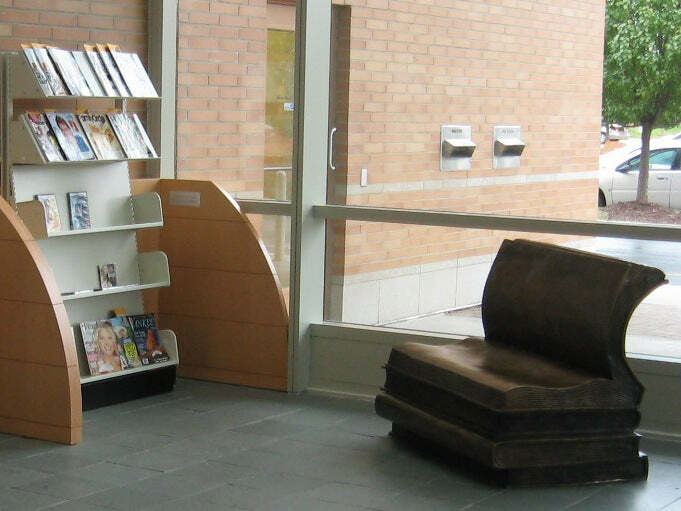 Another idea is a bench that looks like an open stack of books. This unique design is a conversation piece and offers seating for all ages. This as well as other works of art can be placed inside or outside the library. Art also reinforces the importance of books and libraries in our community. With technology changing the way we live, reading inspired art is a reminder of the “good old days”, before cell phones, iPods and video games. Placing art in and around your library, serves many needs. Most importantly it welcomes young families, as well as all members of the community to enjoy and experience the “love of reading’ in a delightful way.